Each Asura and Deva emerges from the same father – Prajapati, share the same residence – Loka, eat together the same food and drinks – Soma, and have innate potential, knowledge and special powers in Hindu epics; the only thing that distinguishes Asura from Devas is intent, action, and choices they make in their lives. Some of the villains from Hindu mythology were exceptionally intelligent and some of them were outrageously stupid, nevertheless, these fascinating facts about them are interesting to know. 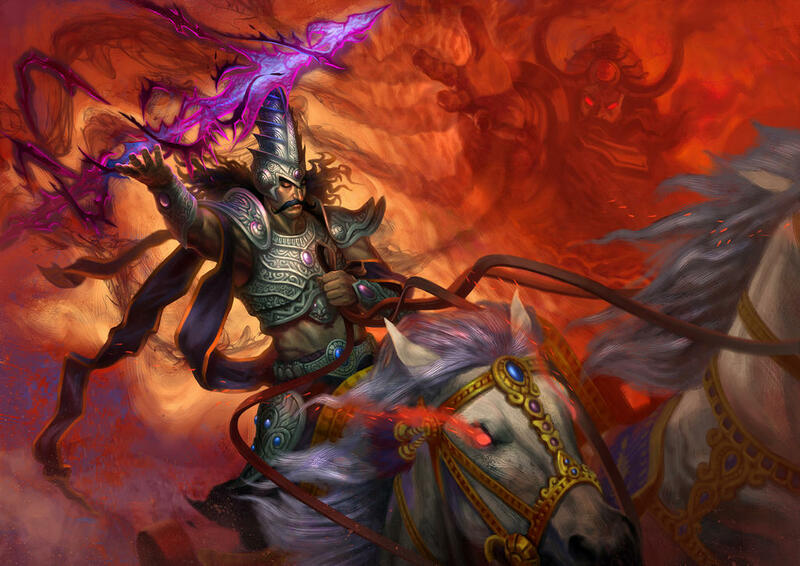 Here, we have a list of 10 Most Interesting and Powerful Asuras in Hindu Epics. At the beginning of the universe, when there were not many creations and not much of anything to worry about, Vishnu slept nonchalantly floating on the shoreless ocean. It was then two specks of dust fell from his ear into the sea and a pair of asuras emerged from them and began swimming. Unknown of their surrounding, where they were, who the giant being asleep in the sea was and how they came to be there, they meditated for many long days and months having in them a burning desire to discover those answers. Eventually, a little music woke them and they looked into the sky to see a beautiful Saraswati. Pleased with their devotion, she granted them the boon of choosing when and how they would die. As the Bhagavata Purana has it, the demons Madhu and Kaitabha stole the Vedas from Brahma and deposited them deep inside the waters of the primeval ocean. It was Lord Vishnu, in his manifestation as Hayagriva, killed them, and retrieved the Vedas. The bodies of Madhu and Kaitabha disintegrated into 2 times 6 — which is twelve pieces (two heads, two torsos, four arms and four legs). These are considered to represent the twelve seismic plates of the Earth. The prime antagonist in the epic Ramayana, the demon King Ravana, though unknown to many, is known for his spiritual conquests and erudite knowledge. According to some believers Ravana is considered to be the original author of Lal Kitab, a principle text of Hindu astrology and palmistry. A fierce warrior and a great administrator as the King of Lanka, he was an equally great musician. As tales have it, when he played his Veena, even the Gods would appear to listen to his music. Nadi Shastra talks about the Ravana being an expert in Ayurvedic texts and a major stakeholder in medical conferences held in those days. While he was moments away from his inevitable death, Rama had asked Lakshman to pay respect to Ravana and learn the methods of proper governance and administration, and as it happened Ravana eventually obliged Laxman with his knowledge. 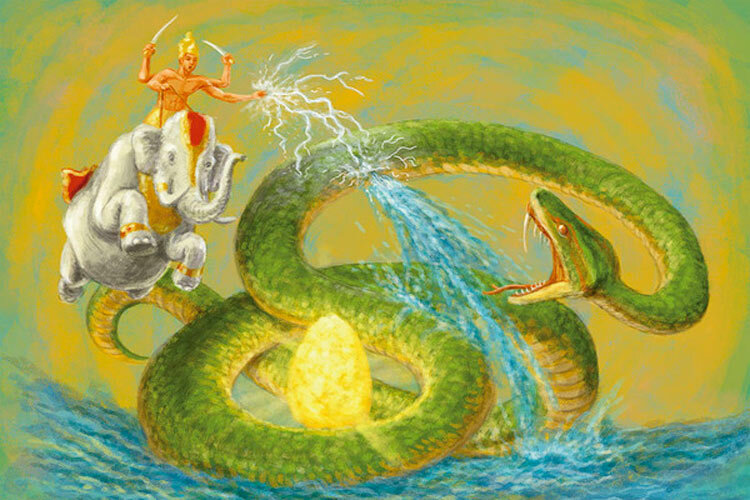 Vritra, a serpent or dragon Asura, and also the drought, a natural calamity personified, is considered the greatest adversary Indra, the King of the highest heaven, had to face. He appears as a dragon blocking the course of the rivers and is heroically slain by Indra. As the Rig Veda has it, Vritra kept the waters of the world captive until he was killed by Indra, who in turn destroyed all the 99 fortresses of Vritra before liberating the imprisoned rivers Vritra broke Indra’s two jaws during the battle, but was then thrown down by Indra and, in falling, crushed the fortresses that had already been shattered. For this feat, Indra became known as Vritrahan “Slayer of Vritra” and also as “slayer of the first-born of dragons”. Also known as, Indrajit, born to the King of Lanka Ravana and his wife Mondadori, was the conqueror of Indra Lok, the highest of the heavens, and according to some accounts is considered as the greatest warriors of all time. A mighty Marathi warrior who possessed the almighty Bhramastra, a weapon created by the Brahman, the supreme of all, he played a prominent role in the great war between Rama and Ravana. Indrajit was the eldest son of Ravana and his wife Mandodari. 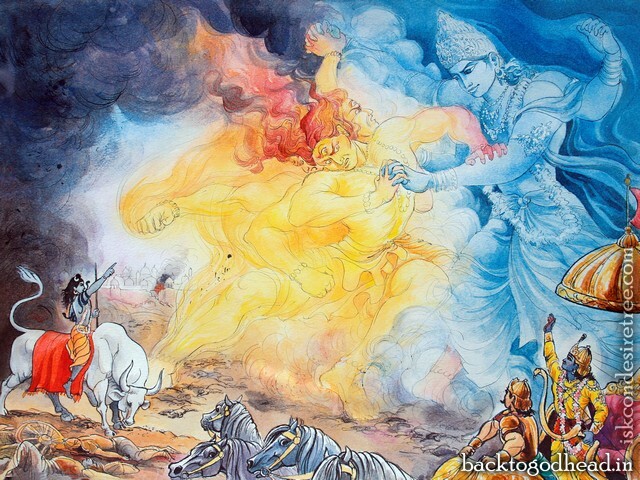 He died a heroic death, after many days of fierce battle, Lakshmana finally did fire the Indrastra, which ultimately severed Indrajit’s head from his body and carried it away. According to some verses, Lakshmana also severed Indrajit’s arm, which fell in front of his wife Sulochana, who made the arm come to life by the power of her devotion towards her husband and got to know about his heroic death on the battlefield when the arm wrote about the same. Rama treated Indrajit’s dead body with honor and returned the body to Lanka for a respectful funeral. An Asura from the Puranic Scriptures of the Hindu dharma, as the king of Daityas, had obtained the boon from Brahma of being virtually indestructible. But as time passed by, he grew arrogant and demanded that all worship him and only him considering himself to be the greatest of the gods. When Prahlada, his own son refused to do so, tales have it that he attempted multiple assassinations of Prahalada. 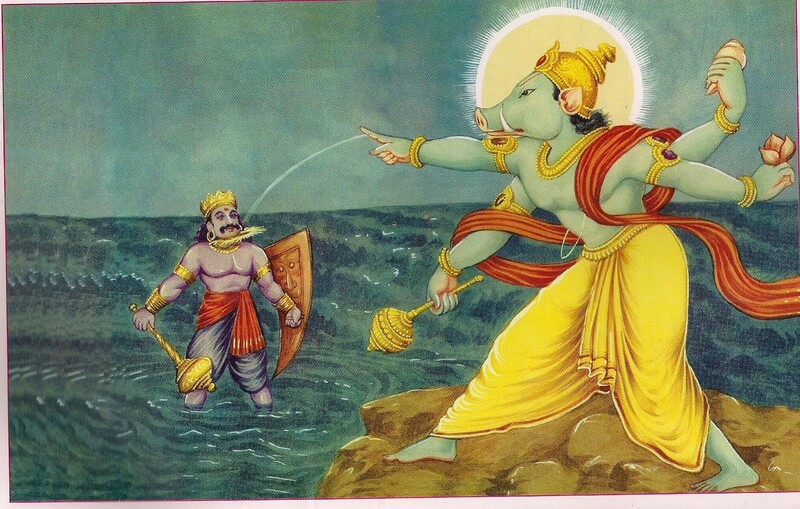 Hiranyakashipu was subsequently slain by Narasimha Avatara of Lord Vishnu. A powerful Asura as mentioned in the scriptures of the Hindu dharma, he fought alongside Shumbha and Nishumbha, the two Ausra brothers who sought to conquers the all three worlds, against Goddess Durga and Goddess Kali. As the tales have it, Raktabija had a boon that whenever a drop of his blood fell on the ground, another of him would be born at that spot. Deconstructing, “He for whose each drop of blood is a seed”, is what the word Raktabija translates to. 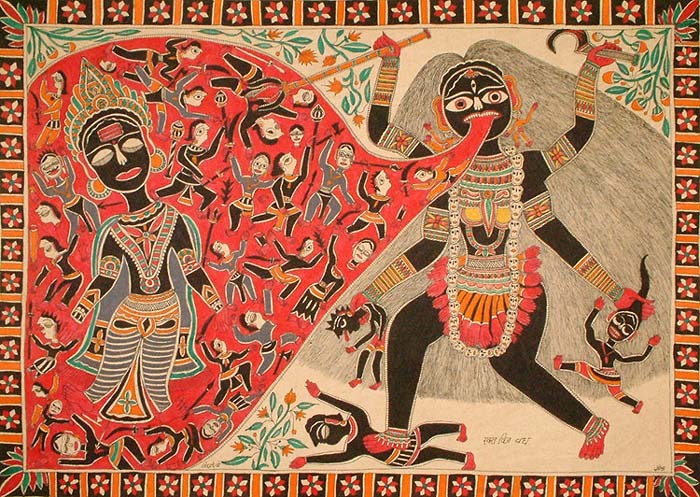 Goddess Kali, who joined the battle in the latter half, stretched her tongue over the Earth and licked up each drop of blood pouring from Raktabija’s body while other goddesses wounded him. Kali devoured his duplicates into her gaping mouth. Ultimately, Raktabija was annihilated. When treacherous Lord Vishnu devoid the Ashuras of the Amrita, the drink of Immortality, for which the Devas and Asuras had churned the mountain together, the episode is famously known as Samudra Manthan, RahuKetu, disguised himself as a deva and got to drink some nectar. However, due to their luminous nature, the sun god Surya and the moon god Chandra were quick to notice the changing of sides. But before the nectar could pass his throat, Lord Vishnu in the disguise of Mohini cut off his head with her divine discus, the Sudarshana Chakra. But as the nectar had gone down his throat he did not die. From that day, his head was called Rahu and body was called Ketu. Later Rahu and Ketu became planets. Hiranyaksha, or the Golden-eyed when translated, was an oppressive Asura who attacked the heavens and thereafter kidnapped and even attempted to destroy goddess Earth. As some of the Puranas have it, he was born to Diti and Kashyap, Kashyap being an ancient sage recognized as the father of the Devas, Asuras, Nagas and all of humanity. Once Hiranyaksha assaulted the defenseless Mother Earth, pulled her deep into the cosmic ocean, Gods appealed to Vishnu to save earth goddess and all life. Vishnu took the avatar of a man-boar or Varaha, as it is called and went to rescue the goddess. He was slain by Lord Vishnu when he attempted to block Vishnu’s path. Banasura in Hindu epics was a thousand-armed asura King and son of Bali who is believed to have ruled the present-day central Assam. 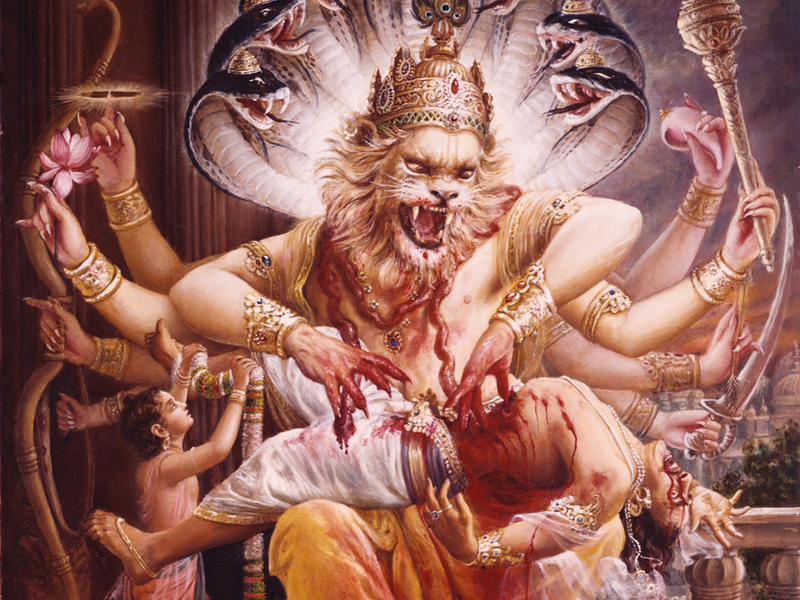 So strong and fierce was his influence that all the kings and even some of the devas shuddered in front of his might. An ardent devotee of Shiva used his thousand arms to play the Mridanga when Shiva was performing the Tandava dance. As the tales have it, with the boon from Lord Shiva that he himself would protect the Asura, Banasura became invincible. But as time passed, Banasura became cruel and arrogant. He locked up his daughter, Usha in a fortress called Agnigarh because many young suitors came to him asking for her hand. One day, Usha saw a young man in her dream and fell in love with him, he was Aniruddha, the grandson of Lord Krishna. Aniruddha was abducted from his palace and presented to Usha. This led to a fight between Lord Krishna and Banasura. Lord Shiva came to the rescue of his devotee but was put to sleep by Lord Krishna. Thereafter, Lord Krishna started severing the arms of Banasura and cut off all except for two. Meanwhile, Lord Shiva regained consciousness and requested Lord Krishna to spare his devotee’s life. Banasura too apologized to Lord Krishna and he was forgiven. Aniruddha was then married to Usha. A powerful Asura in the Hindu dharma, he had a boon by Lord Shiva which gave him the power to turn anyone whose head he touched into ashes (bhasma). Shiva granted this request, but Bhasmasura thereupon attempted to touch the head of Shiva with his hand because he saw Parvati and wanted to possess her, which would only be possible when he turned Shiva into ashes. 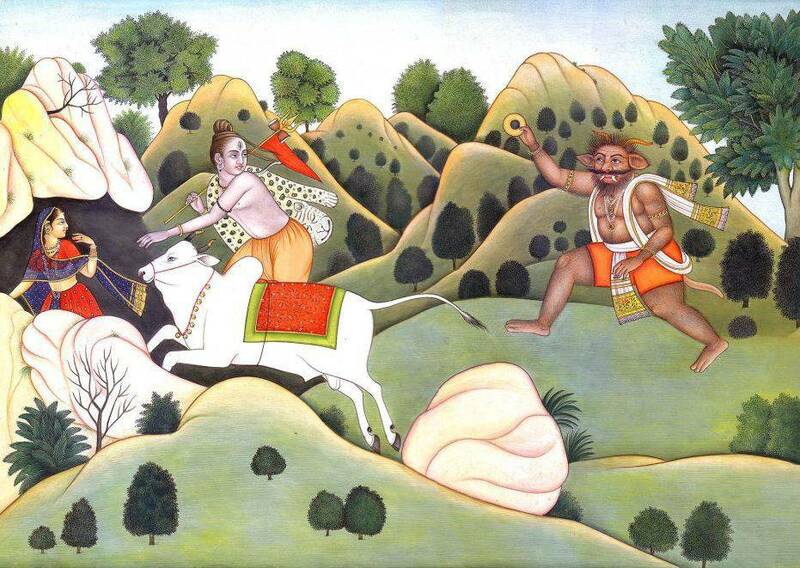 Shiva fled, and was chased by Bhasmasura. Somehow, Shiva managed to reach Vishnu to seek a solution to this predicament. Vishnu, in the form of Mohini, appeared in front of Bhasmasura. Mohini was so exceedingly beautiful that Bhasmasura immediately fell in love with Mohini. Bhasmasur asked her to marry him. She told him that she was very fond of dancing, and would marry him only if he could match her moves identically. While dancing, Mohini, struck a pose where her hand was placed on top of her own head. As Bhasmasura imitated her, he was tricked into touching his own head, and hence he turned into ashes.